Whether it is the thrill of rock n roll or the magical overtures of the great composers, I couldn’t imagine life without music. The latter is, of course, a genre of music that many of us simply don’t appreciate enough. So often, younger generations, which may include those made up of Millennials and Generation Z, seek simple and instant gratification from popular music today. It is not to say that today’s music is uninspiring, but to find inspiration in classical music for instance, is like having an awakening or sensual overload. It is uplifting, moody and at best a great source that might boost improvisations and creativity in all aspects of your life. Of course, don’t just take my word for it, venture outside your own comfort zone and discover for yourself many of the incredible musicians, especially some of the young musicians out there whom have found a calling for classical music, inspired by the wild expression of the great masters. One such young person is 27-year-old Ukrainian pianist Anna Fedorova. From an early age, Anna demonstrated an amazing ability for the piano at home, aroused by both her piano-playing parents. From humble beginnings, she soon after began playing international concerts as a child prodigy. Her immense skills have allowed her to play around the world in some of the most prestigious concert halls. Today, she stands as a multi-award winning pianist, revered around the classical music world for her technical abilities, and one of the reasons why I am so intrigued and in awe of her talents. I recently caught up with Anna and here is some of what we talked about. Mozart is often touted as one of the best examples of a child prodigy. He apparently could pick out tunes on the piano at the age of three. Anna, on the subject of playing the piano so young, is it correct that you began playing the piano at five? What do you remember about those early days around the piano? I started playing piano as early as I can remember. My both parents are pianists so they started teaching me as early as I was able to to be taught I guess. I think I was even 4 years old when I started. I remember that I liked playing piano a lot, it was exciting and fun for me, almost like a game at first but of course very soon it became a very big and important part of my life. When I was 5, I performed on stage for the first time, when I was 6, I played for the first time at big hall of National Philharmonic of Ukraine and when I was 8 – went abroad for the first time and won my first piano competition. Of course the fact that I was raised and taught by my parents made my childhood quite different from most other children. Being a musician is not a profession, it’s the way of life – we don’t have weekends or school holidays, music is always the vital part which is always there, and I was experiencing it from very early childhood. Who are some of your favourite conductors you have performed with? And why? I think the most memorable experience I had was with Jaap van Zweden. We performed Beethoven Piano Concerto No. 5. He is an incredible musician and I felt very free and at the same time secure playing together with him. A lot of things at the concert were very spontaneous, which we both were doing without any discussion before. This creativity, freedom and musical connection were very special for me. Anna, you have played many robust performances over the last few years. One such performance that comes to mind is your Rachmaninov concerto in 2013 at the Concergebouw, in Amsterdam, which amazingly has been viewed more than 14 million times on YouTube! Tell me about your love affair with Russian composers, in particular Rachmaninov, Scriabin, and Medtner? What is it about their work that excites you? As my origins are Ukrainian/Russian/Ossetian – of course I feel connected with Russian music. When I was very small, I was spending a lot of time with my grandmother, who was brought up by her grandmother, who lived during the times of pre-Revolutionary Russia, so somehow from childhood I could feel connected to this time and culture. Also I loved reading the books – the writers such as Tolstoy, Turgenev, my forever favourite poet – Pushkin. I guess in this way I feel the most connected to the music of Rachmaninoff, as his music so strongly brings out this spirit of old Russia, rich and generous Russian soul, wide landscapes… I also adore Scriabin’s music – I guess he managed to find the hugest variety of colours in harmonies in music and he leaves a lot of space for the performer’s creativity – you can sometimes play his music as if you are improvising, without knowing what will happen next and being surprised by every turn of melody and harmony. Could you please enlighten us whose your biggest inspiration from the classical music world? And why? In general I have a lot of inspirational figures – both, from the past and from the present. It’s hard to choose the biggest. But I guess there is one musician I am kind of addicted to and who never fails to inspire me, guide me and who has been one of my strongest musical influences for the past 5 years. It is British cellist Steven Isserlis. From the first time I heard him at the Verbier Festival (in 2012) I was mesmerised. His music making is the most expressive and touching I’ve ever heard in my life. At the same time it’s simple and natural. He is playing as if he is breathing. I was fortunate to have chamber music lessons with him over the last two years at the International Musicians’ Seminar in Prussia Cove, where he is the artistic director. I could just sit in the room all day long and listen to his lessons with other cellists. Probably one of my big dreams is to play a duo recital with him, I hope it would happen sometime. My uncle once had amazing record collection of classical composers from Chopin to Tchaikovsky. But I would often as a kid poke around his stereo instead looking for The Beatles. Bemused, he would instead direct me to Beethoven in particular Beethoven’s Symphony No.9. To think that one piece of music, still excites me today, is an understatement. (It is incredible to think that it would be Beethoven’s last symphony.) What one piece of music do you always gravitate to for inspiration in your life? This is a really difficult question… I guess if one piece of music doesn’t come to mind right away – I guess I can’t really answer it. I guess I had different favourite pieces of music at different times but not the only one for the whole my life. I guess there is so much of genius music written – that I can’t be faithful to only one piece..:) So I guess lets leave this question open for now..
What other music do you listen to that we would be surprised to discover? How exhausting is it to prepare and perform for a concert? Or do you find every moment a joy? It can be quite exhausting when the schedule is really tight that I almost don’t have time to learn the new program or new concerto – in these cases sometimes I just make a marathon of intense practicing when in a short time I am making maximum productivity out of it. It’s hard in a way, but also satisfying and exciting. And I guess I still enjoy every moment of it! Anna, you have preformed in some of the most prestigious concert halls around the world. What is your favourite place in the world to perform? And why? I think it is already for many years Amsterdam’s Royal Concertgebouw (Big hall). This hall has an amazing combination of spectacular history, beauty and fantastic acoustic which you can always recognise when you hear a live recording from there. I was very fortunate to be regularly performing in that wonder-hall since I was 16, and every time it’s a sensation of joy and inspiration. Can you recall one of your earliest performances that you are most proud of? What was it about that performance that made it special? Maybe it was the first performance at the Concertgebouw, when I was 16. It was the first time for me to be on such famous and incredible in all ways stage, I was playing Chopin 2nd Piano Concerto with Philharmonia of the Nations orchestra and Carlos Miguel Prieto conducting, and somehow from the first note I felt that I just can’t afford to play not at my very best. Also I somehow had a feeling that I can hear myself as if I was in the hall.. All the stress and pressure went away and I was just enjoying a wonderful piano, magical acoustic, collaboration with great musicians and of course genius music of Chopin. And I guess it was my best performance until that moment. It was very special. Finally, what have you been up to more recently Anna? I hope you might one day perform in Melbourne, Australia (my hometown)? I hope so too! Actually in July I might come to Australia for the first time which I am very excited about! But this time it’s going to be near Brisbane. Otherwise I will have quite a number of interesting projects this season – this month I am going to Japan already for the 3rd time this year to perform with Kyoto Symphony orchestra Beethoven 5th piano concerto, also will have a number of tours in the UK, a tour in the USA, performance of Rachmaninoff’s Rhapsody on a theme of Paganini at Amsterdam Concertgebouw, the 2nd edition of the chamber music festival in Ede, where I am an artistic director, and many other exciting concerts. 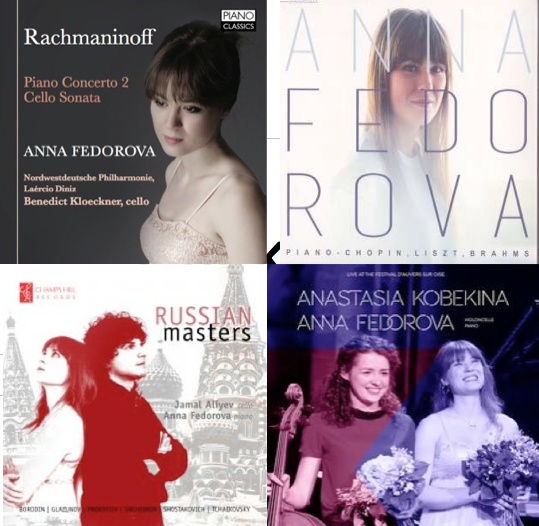 Anna Fedorova’s classical recordings are available through iTunes and to listen via Spotify. You can connect with Anna Fedorova via her Facebook page or twitter feed @Fedorova_Anna. You can also visit or contact Anna fedorova via her website. Watch her on You Tube. Photo credits: The header image of Anna Fedorova is courtesy of Hazard Chase and ©Copyright Marco Borggreve. It cannot be used without their expressed permission. I am not the uploader of You Tube clips embedded here. Anyone who can play Rachmaninoff’s ‘Piano Concerto No. 2’ that skillfully is a rare talent. Nice interview Rob. I so enjoyed this interview!